iPhone and Apple Watch users searching for a handy way to charge both devices whilst away from the grid may be interested in a new battery pack aptly named the BatteryPro which has been created by Elevation Lab. Currently available to preorder priced at $99 the BatteryPro will start shipping in three weeks time throughout the US and is now available at an introductory offer providing a discount of 20% of the recommended retail price. Watch the demonstration video below to learn more about the BatteryPro for iPhone & Apple Watch and how it can help keep your mobile devices powered whilst away from the grid using its integrated 8000mAh battery. • Integrated MFi-certified Apple Watch Magnetic charger. • Smart high-speed USB out. • Designed to be comfortable to carry in your back pocket and when holding against the back of your phone (the outside dimensions are close to an iPhone 7 for size reference). 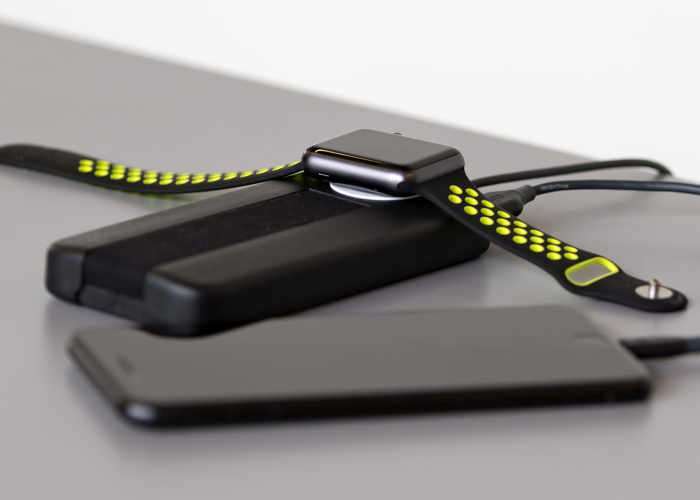 • StowStrap flips to secure Apple Watch while charging, so you can charge in your bag or purse without issue. • Provides over two weeks of Apple Watch charges, 3+ days of iPhone use with a 8000mAh battery. • Balances on end for Nightstand mode.